Sleeveless sheepskin waistcoat (pieptar) covered with brown velvet and edged with appliquéd leather, and decorated with brown and orange floral embroidery. 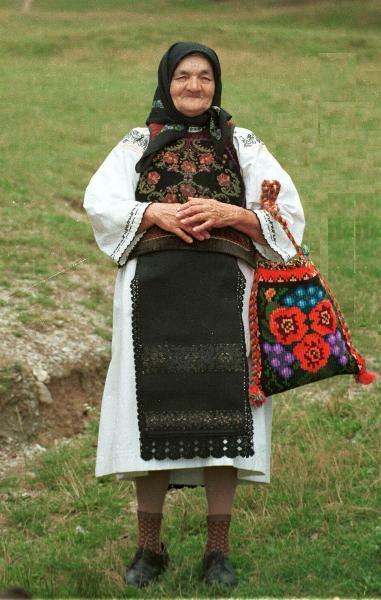 Black narrow woven woollen aprons (catrințe) decorated with black silk embroidery and edged with black crochet lace. Black printed floral headscarf. Woollen cloth bag (traistă) with woven floral pattern. Photo taken at Sângeorz-Bai, 1991.